Apple today launched its annual Back to School promotion starting in the US and Canada. 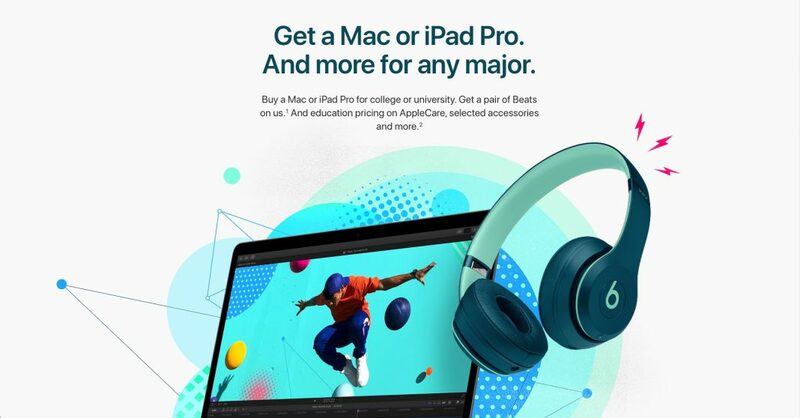 The deal, which will run from July 12th to September 25th will offer a complimentary Beats product on the purchase of an eligible Apple iPad Pro or Mac products. According to Apple, those eligible for Education pricing include current/newly accepted university students and their parents along with teachers and staff at all levels. This promotion will apply in addition to the standard Apple Education pricing and 20% off AppleCare. This year Apple is bundling the Beats Solo3 Wireless for a Mac purchase and a Powerbeats3 Wireless for the iPad Pro models, both from the new Beats Pop Collection. Upon purchase of an eligible product, Apple will instantly credit you with the equivalent cost of the corresponding Beats deal. To upgrade your complimentary Beats, the remaining balance will be required.